As we surged through the green waters surrounding the island of Sante Fe, our zodiac driver cut the engine to a slow speed as our beach landing came into view! It was our first wet landing on the Galapagos with Happy Gringo, where you get out of the zodiac into the sea rather than get off at a pier. And there was good reason for this too! As the beach came into view, we could make out a few black dots on the beach. 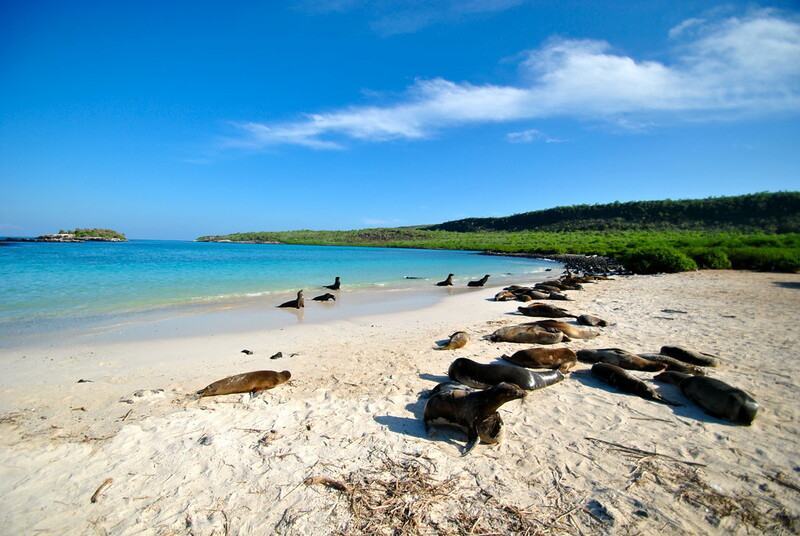 As we got closer, we were astounded to see hundreds of sea lions lying on the beach taking in the afternoon sun. Some were sunning themselves, some macho fighting in the water, and some lying in the waves as the tide pulled them in and out of the bay. Along the beach we could see the alpha black male patrolling his beach and many female partners! It was untouched, and a perfect example of our time on the Galapagos. Want to know what we saw? Of course you do! Landing here was one of the highlights of all our travels, and set the tone for the rest of our Galapagos experience!